Even More, Ways To Save At The Pet Beastro! On top of our loyalty program where you can earn points for dollars and rewards. We offer several frequent buyer programs to save you money. 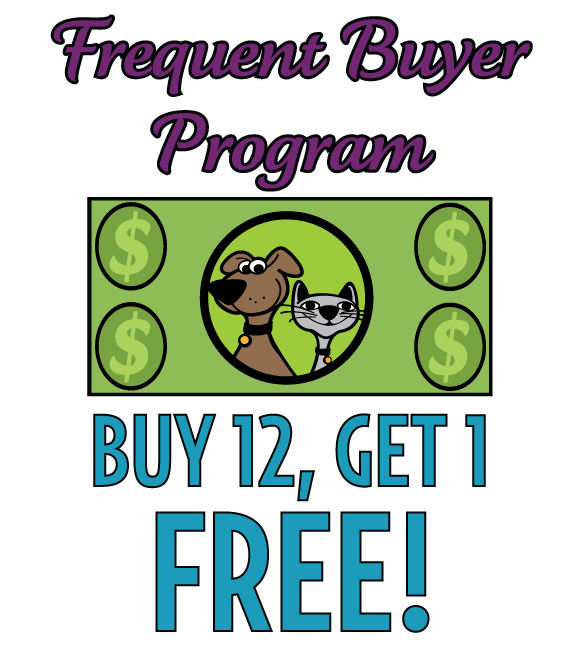 Wondering whether your favorite pet food or treat has a frequent buyer program? We’re breaking it down for you below! Here’s how you can save on these popular products when you’re a loyal and repeat customer. Purchase 12 regularly priced animal chiropractic services or pet food/products & from the following companies at The Pet Beastro and receive one FREE. Must sign up during the first purchase of a product. Please ask staff to add the program to your file. All 12 items must be from the same manufacturer and the same size. We keep track of your purchases our computer. We will reprint a purchase history to send in for the customer. The customer doesn’t have to save anything. The free product awarded will be the same as the least expensive item that the customer purchased. Free item does NOT count toward the next round of frequent buying items. For more info on Animal Chiropractic Services click here.